I have been to the Himalayas twice. Both times, my most memorable moments have been at the Lakes & the Passes. Their beauty is incomparable & my love for them is eternal. With the crisp mountain air in our face, listening to the Buddhist Morning Prayer, Khardung La or the ‘Pass of the Lower Castle’ is where we headed to first, after a day of acclimatisation. This Himalayan Pass’s claim to tourist-fame is that at 18,380 feet it is the highest motorable road in the world. But this is a fact that is more often than not disputed. While being photographed with this signboard is a classic tourist must-do. These three Stupas with the fluttering prayer flags crowning them remain the photographers’ favourite. A short climb gets you here, to the quaint little temple & these stupas. The mountainside disappears in prayer flags & as you find your way through them, you might come up short of breath, for the climb though short gets a little tough. 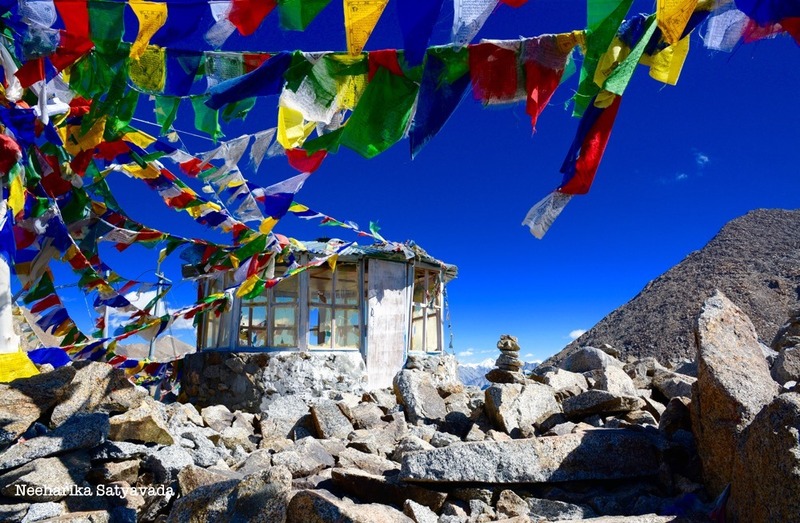 The rarified atmosphere of Khardung La, at its immense height is known to cause altitude sickness. Though no one in the group had to tackle with this, it is recommended that you check your oxygen levels & blood pressure before you decide to undertake this journey. Once you reach level ground & catch your breath, you cannot help but be overwhelmed! The Himalayas just never cease to surprise you with all that they have to offer. The scenic beauty, which inspires in you a sense of achievement & pride in just being able to witness it. The solitude, which makes you feel like you have found your own little space of peace in this crowded world, ‘far from the madding crowd’ so to say! Also Read: The Goat Village: Take me away! Right opposite to the stupas, a series of steps lead you to a rain-washed cabin & from this edge, the snow covered peaks are almost within touching distance and the wooden cabin only adds to the intrigue of the scene. PS: When you come back down, DO NOT miss the Qahwah at Rinchen Cafe. The only canteen amongst the few structures on the other side of the road. While the Arabic Qahwah is coffee based, the Kashmiri version is tea based. Nonetheless, you will love the lingering taste of the cardamom from this warm drink, right after being out in the sharp chilly breeze. Atleast I did! Thank you so much for going through my blog & liking it too! Its great encouragement to know your stories have an audience!! 😊 You are so right about the clouds there.. they change the landscape, the photos everything..
Hi….lovely place….looks pretty much untouched by man!! Did u get a peek into the little cabin…..loved that pic. It is like a meeting point of the abode of the Gods (represented by the sky & the mountains)….and man (the quaint cabin).